Plasticité et mobilité, les clefs de la mémoire ! Les chercheurs ont combiné des techniques de chimie, d’électrophysiologie et d’imagerie à haute résolution pour mettre au point une méthode inédite d’immobilisation des récepteurs au niveau des synapses. Grâce à cette méthode, les mouvements des récepteurs sont stoppés, ce qui permet d’étudier l’impact de leur immobilisation sur l’activité cérébrale et les capacités d’apprentissage. Ils ont ainsi démontré que le mouvement des récepteurs est indispensable aux processus de plasticité synaptique en réponse à une activité neuronale intense. Ils ont ensuite exploré le rôle direct de la plasticité des synapses dans l’apprentissage. En apprenant à des souris à reconnaître un environnement particulier, ils ont pu mettre en évidence que le gel du mouvement des récepteurs permet de bloquer l’acquisition de cette forme de mémoire, démontrant ainsi l’implication de la plasticité synaptique dans ce processus. 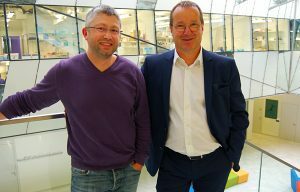 In a joint effort, the teams of Daniel Choquet and Yann Humeau from the Interdisciplinary Institute for Neuroscience (CNRS/Université de Bordeaux) in Bordeaux recently discovered a new mechanism for activity dependent information storage in synapses and a means of controlling the storage process. The breakthrough moves researchers closer to unveiling the mystery of the molecular mechanisms of memory and the potential to shape the learning process. The research was carried out primarily by researchers at the IINS, with some contributions from researchers in the Institute of neurodegenrative disease (IMN, Université de Bordeaux/Inserm) and the Bordeaux Imaging Center (BIC, CNRS/Université de Bordeaux/Inserm). The article appeared online September 14th in the Nature website (http://www.nature.com/nature) and will be published in print in the September 21st issue of Nature. 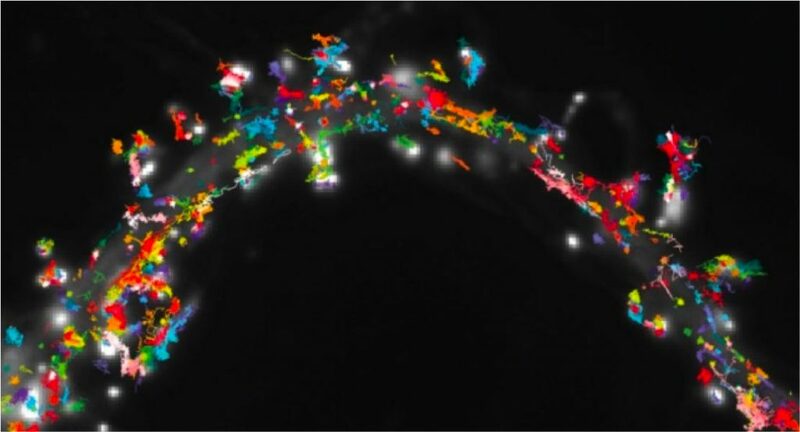 Synaptic plasticity at excitatory synapses– the ability of the synapse to adapt in response to neuronal activity – was discovered nearly 50 years ago, leading the scientific community to propose it as a vital functional component of memorisation and learning. Neurotransmitter receptors – concentrated at the synapse level – play a key role in these activity-related changes in transmission efficacy. A few years ago, the team of D. Choquet discovered that neurotransmitter receptors were not immobile as thought, but in a constant state of agitation. They posited that controlling this agitation through neuronal activity could modulate the effectiveness of synaptic transmission by regulating the number of receptors present at a given time in a synapse. The new research has taken the two teams further in their understanding of the basic mechanisms behind how information is stored in the brain. Scientists combined techniques based on chemistry, electrophysiology and high-resolution imaging to develop a new method to immobilise receptors at synaptic sites. This method successfully stops receptor movement, making it possible to study the impact of the immobilisation on brain activity and learning ability. This tools in hand, they successfully test and demonstrate that movement of the AMPA subtype of glutamate receptors is essential to long term synaptic plasticity in response to intense neuronal activity at Schaeffer collaterals to CA1 neurons in the hippocampal formation. They also delineate the respective contributions of diffusion-trapping of pre-existing surface receptors vs newly exocytosed receptors in the time course of synaptic potentiation. Researchers also explored the direct role of synaptic plasticity in learning. By teaching mice to recognise a specific aversive environment, they show that halting receptor movement efficiently blocked the acquisition of this type of contextual, hippocampus-dependent memory, confirming the role of synaptic plasticity in this cognitive process. Long-term potentiation (LTP) of excitatory synaptic transmission has long been considered a cellular correlate for learning and memory. Early LTP (eLTP, <1 hour) had initially been explained either by presynaptic increases in glutamate release or by direct modification of post-synaptic α-amino-3-hydroxy-5-methyl-4-isoxazolepropionic acid receptor (AMPAR) function. Compelling models have more recently proposed that synaptic potentiation can occur by the recruitment of additional post-synaptic AMPARs, sourced either from an intracellular reserve pool by exocytosis or from nearby extra synaptic receptors pre-existing on the neuronal surface. However, the exact mechanism through which synapses can rapidly recruit new AMPARs during eLTP is still unknown. In particular, direct evidence for a pivotal role of AMPAR surface diffusion as a trafficking mechanism in synaptic plasticity is still lacking. Using AMPAR immobilization approaches, we show that interfering with AMPAR surface diffusion dramatically impaired synaptic potentiation of Schaffer collateral/commissural inputs to cornu ammonis area 1 (CA1) in cultured slices, acute slices and in vivo. Our data also identifies distinct contributions of various AMPAR trafficking routes to the temporal profile of synaptic potentiation. In addition, AMPAR immobilization in vivo in the dorsal hippocampus (DH) before fear conditioning, indicated that AMPAR diffusion is important for the early phase of contextual learning. Therefore, our results provide a direct demonstration that the recruitment of new receptors to synapses by surface diffusion is a critical mechanism for the expression of LTP and hippocampal learning. Since AMPAR surface diffusion is dictated by weak Brownian forces that are readily perturbed by protein-protein interactions, we anticipate that this fundamental trafficking mechanism will be a key target for modulating synaptic potentiation and learning.